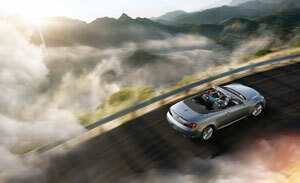 The 2012 Infiniti G Convertible remains one of the most seductive vehicles in its class. Created around the central idea that a luxury performance convertible should look equally inviting with its top up or down – and be equally enjoyable to drive sans roof or not – the G Convertible combines grace and performance with signature Infiniti attention to detail. 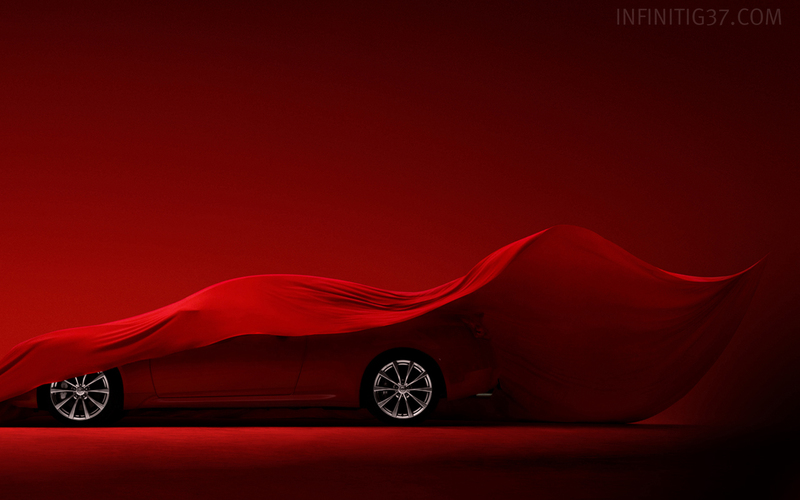 Based on the highly popular Infiniti G Coupe, the G Convertible offers a model-exclusive design from the A-pillars back, including a unique body structure and a wider rear track. 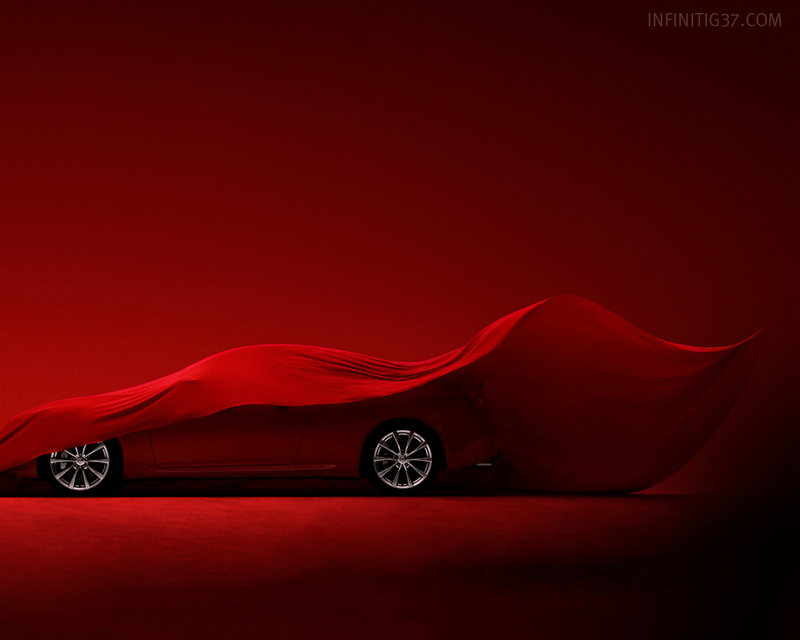 Its athletic, well-proportioned coupe-like styling, flowing front fenders, wave-like hood, and signature Infiniti double-arch grille offer an uncommon presence that is only enhanced when the exclusive three-piece power hardtop retracts with one-button operation securely into the trunk. control system that adjusts fan speed in accordance to top position and vehicle speed. 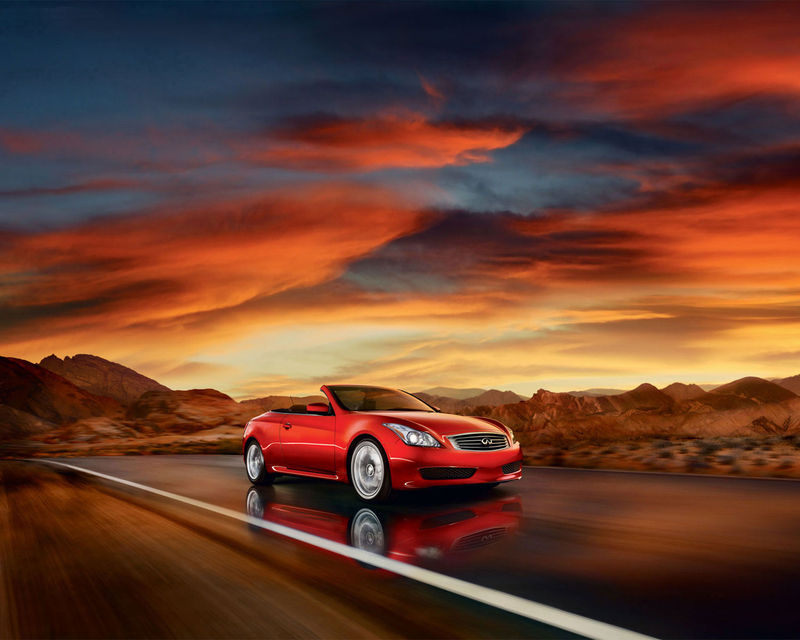 The G Convertible maintains its classic Infiniti G coupe-like silhouette with the top up through use of a special three-piece “clamshell” retractable hardtop, which allows for both a stylish shorter rear overhang and a low trunk lid. Compared to G Coupe, the G Convertible utilizes unique body panels from the A-pillar back, a 1.1-inch wider overall width, wider rear track and modified rear suspension. 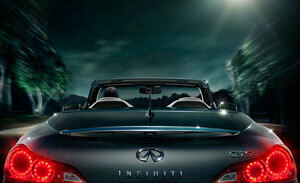 Along with its stunning proportions, the G Convertible offers signature Infiniti styling cues, such as flowing front fender curves, a wave-style aluminum hood, expressive front fascia with double-arch grille and L-shaped High-Intensity Discharge (HID) bi-functional xenon headlights with integrated fog lamps. The G37 Convertible Sport 6MT includes a unique front fascia/bumper design (also included with the G37 Convertible with Sport Package). In the rear, the taillights are unique to the G Convertible, incorporating an inner “circle of light” for added style. The chrome rear trunk finisher incorporates both an integrated high-mount stoplight and the small camera for the standard RearView Monitor system. The automatic top opening/closing sequence takes approximately 30 seconds from start to finish. The open/close switch is located on the center console, just behind the transmission shifter lever. For 2012, the G Convertible is offered in eight exterior colors: Vibrant Red, Malbec Black, Liquid Platinum, Graphite Shadow, Black Obsidian, Moonlight White, Pacific Sky and Lapis Blue. enjoying open-air driving, such as added interior noise and turbulence, added heating and cooling system demand and even the fact that the seating surfaces can get hot in the sun or cool at night. The driver-oriented cockpit features an Infiniti signature instrument panel design with Infiniti electroluminescent instrumentation with a white illumination color scheme, integrated multi-function information drive computer display and signature analog clock. The double hand-stitched leather-covered steering wheel is designed for maximum comfort and usability, with standard wheel-mounted audio and cruise controls. The G Convertible with Sport Package also has solid magnesium paddle shifters for its 7-speed automatic transmission. Special Silk-Obi aluminum interior trim, inspired by fine Japanese silk, is located across the instrument panel, on the center console and on the door panels. Also available are interior Gloss Maple Accents. Leather-appointed seating is standard and is offered in three colors – Graphite (black), Wheat and Stone. Heated 8-way power driver/8-way front passenger seats are standard, with Climate-Controlled Seats available as part of the Premium Package models with the automatic transmission. The G37 Convertible Sport 6MT includes special sport-styled front seats with manual thigh extension and driver’s power thigh and torso support – along with sport stitching for the front seats and steering wheel, high-grip aluminum pedals and foot rest. A power walk-in device with position memory provides easy access to the 2nd row seats (the front seats move forward automatically at the touch of a button to allow passengers into the rear seats). The G Convertible’s long list of comfort and convenience features includes standard Infiniti Intelligent Key with Push Button Ignition and an Adaptive Dual Zone Climate Control System air conditioning system that adjusts to provide optimal comfort with the top up or down. Two audio systems are available, starting with a standard 6-speaker AM/FM/CD system with MP3 playback capability, Radio Data System (RDS) and center console-mounted auxiliary input, 7-inch color display and XM® Satellite Radio (XM® subscription required, sold separately). A second system is also offered – a 13-speaker Infiniti Bose® Open Air Sound system with AudioPilot® 2.0 technology that automatically optimizes EQ settings for open/closed top positions. The system’s special Bose® Front seat Personal Speakers, mounted in the front seat head restraints, enable superior front audio quality regardless of the top position. Other available G Convertible features include standard Bluetooth® Hands-free Phone System and the available Infiniti Navigation System with available XM NavTraffic® and NavWeather® (XM subscription required, sold separately), Streaming Audio via Bluetooth® and Zagat Survey® restaurant reviews and touch screen. Like the G Coupe and G Sedan, the G Convertible’s outstanding dynamic performance credentials start with a combination of its advanced FM platform and award-winning V6 engine. Every 2012 G Convertible comes equipped with a standard 3.7-liter V6 engine with VVEL (for Variable Valve Event and Lift), rated at 325 horsepower and 267 lb-ft of torque. The VVEL system combines hydraulic-controlled variable valve timing and electronically controlled variable valve lift on the intake side, helping to improve not only performance and response but also emissions and fuel efficiency (over a non-VVEL system). The engine is mated to a choice of an electronically controlled 7-speed automatic transmission with manual mode, downshift rev matching, Drive Sport (DS) mode, Adaptive Shift Control (ASC) and available solid magnesium paddle shifters; or a responsive, lightweight close-ratio 6-speed manual transmission on the G37 Convertible Sport 6MT. alignment changes and reduce suspension friction for nimble handling and smooth riding characteristics. Responsive steering is provided by a vehicle-speed-sensing system, with sport-tuned steering offered with the G37 Convertible Sport 6MT and G37 Convertible with Sport Package. Standard on all G Convertibles is Vehicle Dynamic Control (VDC) and Traction Control System (TCS). Braking performance is provided by standard 4-wheel vented discs with 4-channel, 4-sensor Anti-lock Braking System (ABS), Electronic Brake force Distribution (EBD) and Brake Assist. The G37 Convertible with Sport Package and G37 Convertible Sport 6MT are further enhanced with larger ventilated rotors (14.0-inch front/13.8-inch rear) and aluminum four-piston calipers front/two-piston calipers rear, embossed with Infiniti lettering. Also available is Infiniti’s Intelligent Cruise Control (ICC), which assists in maintaining a consistent following distance from the vehicle ahead. Preview Braking identifies sudden braking situations with laser sensors to determine distance and relative speed of the vehicle ahead in the same lane and “pre-pressurizes” the brake system before the driver steps on the brake pedal. Standard on the G37 Convertible are 10-spoke 18-inch aluminum-alloy wheels with Dunlop SP Sport MAXX A1-A P225/50R18 front and P245/45R18 rear all-season tires, while the G37 Convertible Sport 6MT utilizes special 19-inch cast aluminum-alloy wheels with Bridgestone Potenza RE050A high performance tires (P225/45R19 front and P245/40R19 rear). The 19-inch wheels and tires are also available on the G37 Convertible as part of the Sport or Performance Tire & Wheel Packages. An Advanced Air Bag System (AABS) with dual-stage supplemental front air bags with seat belt sensors and occupant classification sensor is standard, along with door-mounted curtain side-impact supplemental air bags, front-seat mounted side-impact supplemental air bags and front seat Active Head Restraints. The rear seat includes fixed head restraints with rear Pop-up Roll Bars. The G Convertible also features reinforced front side members, front pillars and body sills. 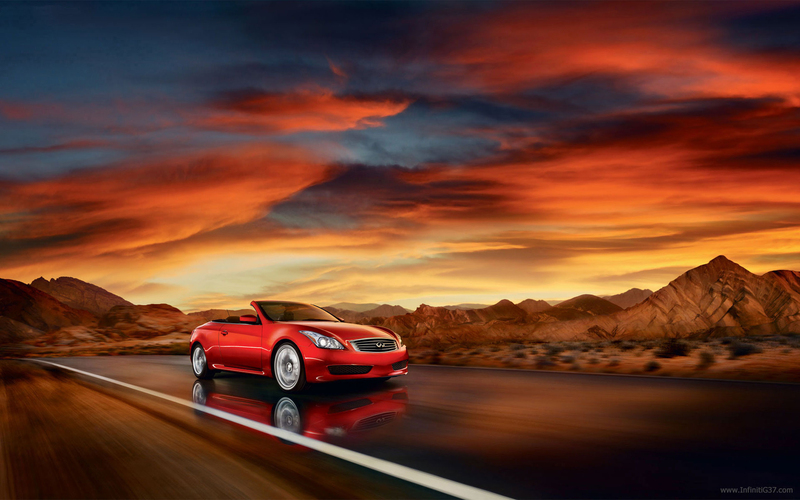 The 2012 Infiniti G Convertible is available in two models: G37 Convertible and G37 Convertible Sport 6MT. A number of options and packages are also available, including a Premium Package that features the Bose® Open Air Audio Sound System with 13 speakers and AudioPilot® 2.0 technology, and Bose® front seat Personal Speakers, Climate-Controlled seats with heating and cooling functions (non-Sport models), power tilt and telescoping steering wheel and steering column, driver’s seat power lumbar support and Rear Sonar System. The Sport Package includes split V-spoke 19x8.5-inch aluminum-alloy wheels with P225/45R19 W-rated summer performance tires (front), 19x9.0-inch aluminum-alloy wheels with P245/40R19 W-rated summer performance tires (rear), Sport Brakes with aluminum 4-piston opposed front calipers with 14.0x1.3-inch ventilated discs and 2-piston opposed rear calipers with 13.8x0.8-inch ventilated discs, 14.7:1 sport-tuned steering gear, unique sport front fascia, aluminum pedals and foot rest and solid magnesium paddle shifters. The Technology Package adds Intelligent Cruise Control (ICC), Pre-Crash Seat Belts, rain-sensing flat-blade front wipers, and an Advanced Climate Control System (ACCS) with Plasmacluster™ air purifier. Also available are a Performance Tire & Wheel Package, Navigation Package, and Interior Accent Package with High Gloss Maple accents on the center console, instrument panel and doors.